At the Atocha train station in Madrid, a production and live-action Camp housed the Adaptive Actions project for almost a month. Experiences and materials – whether in the making or from past or future initiatives – were presented at the Camp. Supporters assisted actors and discussed possible additions, proposed actions and ensuing issues with participants. At the Atocha train station in Madrid, a production and live-action Camp housed the Adaptive Actions project for almost a month. 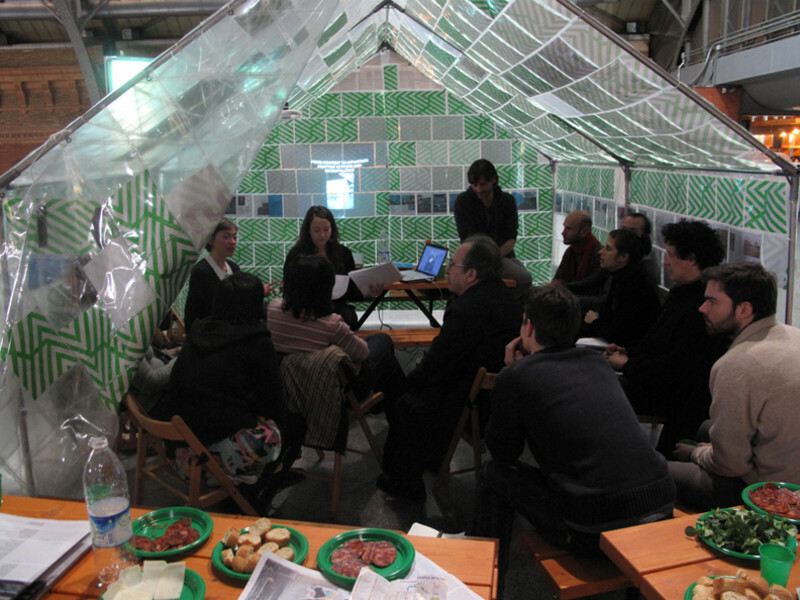 Experiences and materials – whether in the making or from past or future initiatives – were presented at the Camp. Supporters(1) assisted actors and discussed possible additions, proposed actions and ensuing issues with participants. The program of events at the AA Camp (workshops/actions, lunch-and-learns) on specific topics and locations built bridges between actors and actions. The latter underwent prolongations,remodulations; some were launched in Madrid (as well as in other cities and countries), then collected in a joint art project. The aim, as Maurizio Lazzarato would say, is not to neutralise differences but, conversely, to enrich the concept of commonality through these differences(2). As he argues, the challenge is to find ways to retain this multiplicity, to embrace heterogeneity while maintaining disparity. The second publication(3) was developed and produced in Madrid, live and in public, within a limited timeframe. During one month in the production camp, publication material was assembled and edited. Actors could contribute directly to the selection and preparation of material on site or by email. Throughout this process, actors posted new actions in the Camp, hallmarking the renewal “in the present” of adaptive actions, in counterpoint to those featured in the publication. At the AA Camp, structure and planning coexisted with the unexpected. This project expands thoughts on various themes related and complementary to architecture and art, including the concept of post-production and unplanned, un-programmed transformation and appropriation that give meaning to the city. By this process, various impressions will merge, oneoff, geographically isolated acts will converge and, in vast numbers, they will take new directions, coherence, strength, and arouse interest by creating unexpected – and otherwise impossible – associations, links and cross-references. The project focuses on micro-actions because these prompt or modify our perception of the urban environment and their design is a reflection, an expression of behaviour in tune with artistic creation. Many actions are anonymous, unsigned, clandestine, pervious to transformation – the author knows that these actions will eventually be changed, maintained or possibly eliminated by others. Their relation to the context suggests a potential re-appropriation, but the collective imagination they establish – especially if their number multiplies and if their presence becomes widely known – ensures the sustainability of a state of mind akin to artistic expression. Consciousness, signature and participation are thus inherent to this type of project. Citizen actions suggest a different process for shaping cities, open and collaborative, responsive and crosscutting. 1 Several past and new AA collaborators, in turns, attended the Madrid AA Camp. 2 Yves Citton, Puissance de la variation, Maurizio Lazzarato, Multitudes 20, pp.187-200 and book : Puissances de l’invention. La psychologie économique de Gabriel Tarde contre économie politique, also published at Les empêcheurs de penser en rond, 2002. 3 The first Adaptive Actions publication (UK edition) was launched in March 2009. It features many actions as well as articles by Pascal Nicolas-Le Strat (France), Judith Laister (Austria), Frank Nobert and Jean-François Prost. WHERE ARE NOW THE BEAKS OF BIRDS?